The team at Social Outcomes has assisted in the design and implementation of several social impact bonds (SIBs) and payment by outcomes contracts in Australia, including the Benevolent Society Social Benefit Bond in NSW and the Youth Connect Social Impact Bond in Queensland. Social Outcomes has also designed a gender-focussed Development Impact Bond (DIB). If you are interested in exploring SIBs, DIBs or payment by outcomes contracts, please contact us: hello@socialoutcomes.com.au. Information on Green Bonds is available from our impact investing page. 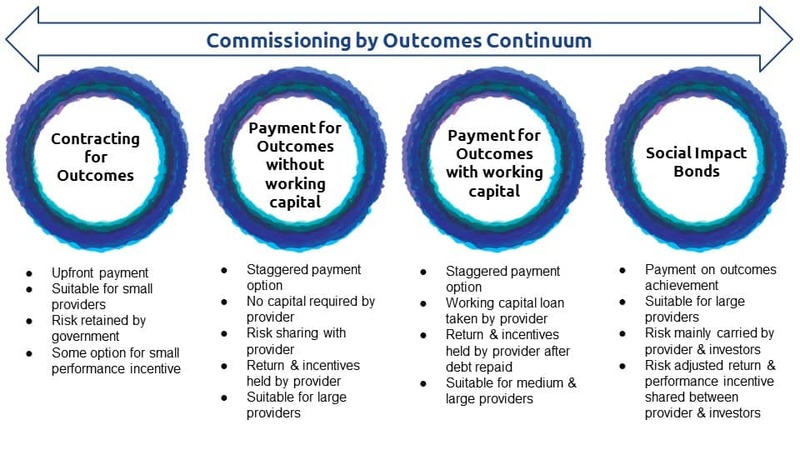 State Governments across Australia, and numerous government bodies and investors around the world are moving towards contracting for social outcomes, rather than inputs or outputs. This is an important development in social service delivery. When social service providers are supported in delivering outcomes, they are better able to innovate in their service delivery. The emphasis of the contracting arrangements in SIBs and payment by outcomes contracts rests on what outcomes are achieved through service delivery program, rather than the nuts and bolts of how those programs are delivered. For instance, rather than count the volume of medication prescribed to chronically ill patients, the focus shifts to counting the number of patients who recover from, or reduce, their illness. This allows social service providers to innovate, and integrate a range of programs which are proven to assist in improving the health of these patients (say, mental health counselling, exercise regimes, stable housing environments, etc). Typically under a payment by outcomes approach, government defines the specific outcomes they wish to achieve and fund, such as reduced re-offending rates of prisoners, reduced chronic health conditions, reduced homelessness, reduced unemployment, improved education, etc. A service provider is then selected based on their demonstrated ability to achieve the desired outcomes. The government entity does not design the service delivery model itself, that is up to the service provider. This approach is a significant change in contracting relationships between government and the social sector. Under the current arrangements, contracts are usually created around input and output delivery, and government may micromanage the contract in a way that can unintentionally distract the provider from effective delivery. Payment by outcomes contracting focuses both government and service provider on the attainment of outcomes. Clear measurement and evaluation of the outcomes achieved is essential to any contract. Government departments and/or a third party evaluation team measures and provides ongoing feedback over what is typically a 3 to 10 year period, allowing the provider to continually innovate and refine their programs, to improve the outcomes achieved. An outcomes-contracting approach requires culture change among all parties. Government will need to transform its current procurement and contract management processes, and build capability in data collection, analysis and outcomes measurement. Service providers will need to embed robust outcomes measurement frameworks into their organisations and programs, and their boards will need to build capability and openness to assess and take on greater risk. In the case of SIBs, investors will also need to develop the ability to assess social risk and rate investments, in order to participate. NSW led the way on SIBs in Australia. The first two Australian social impact bonds (Benevolent Society Bond and Newpin) were issued in NSW in 2013 and dealt with reuniting or preventing the removal of children into the state care system. Three more social impact investments have been issued since that time in the areas of recidivism (On TRACC), palliative care (Silverchain) and mental illness (Resolve). In February 2015, the Office of Social Impact Investment (OSII) was established to facilitate outcomes based contracting. OSII has developed a range of tools for service providers and is open to accepting market-led proposals. The Queensland government launched three social impact bonds in 2017 under its pilot social benefit bond program, in the areas of reducing homelessness experienced by young people leaving the state care system (Youth Connect), recidivism in young offenders (Life Without Barriers) and reuniting young people in state care with their parents (Newpin). Queensland is open to accepting market-led proposals. The South Australian government launched its first social impact bond in 2017 focussing on reducing long term homelessness (Aspire). This bond involves a partnership between Hutt St Centre, CommonGround Adelaide and Unity Housing. The Victorian Government launched its first social impact bond in December 2017 in order to homelessness (Journey To Social Inclusion Program) . It is currently in the negotiation phase relating to a second SIB focussed on providing support to young people leaving the state care system. The ACT government is looking to move its contracting to an outcomes approach and has been quietly making considerable progress. The Western Australian, Tasmanian and Northern Territory governments are still in the exploratory phases. There has been a rapid growth in the number of SIBs around the world, since the first one in 2010, dealing with reducing recidivism in Peterborough, UK (see the evaluation report here). The SIBs deal with a variety of social areas including homelessness, chronic disease, early childhood education, criminal justice, education and unemployment. The service delivery approaches and the bond structures are as varied as the areas of social impact. Social Finance UK keeps an updated global database and interactive map of the social impact bonds being developed and launched around the world, together with project overviews and links to further information. The Brookings Institution has published a series of reports on social impact bonds at a global level, including one summarising the lessons learned (PDF) from the first five years of social impact bonds and another looking at social impact bonds in developing countries (PDF). For information on Development Impact Bonds (where global aid agencies and/or global foundations are likely to be the outcomes funder, rather than domestic governments), see the report by the Centre for Global Development. The first DIB sought to address sleeping sickness in Uganda, and was developed by DFID in the UK. Other examples include the Educate Girls DIB (PDF) in India, and the ICRC’s bond to build and operate three physical rehabilitation centres in conflict-affected parts of Africa.